The Sorting Beetle inspires and educates Hjørring’s children and adults on how to convert waste and garbage into new resources, just like wild beetles. Hjørring Municipality seeks to engage and meet people where they are. 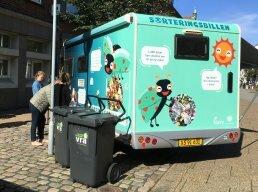 With their converted camper van, The Sorting Beetle (Sorteringsbillen), Hjørring Municipality employees can drive around to children and families to explain how to sort their waste and why. The camper van is a rolling creativity workshop which visits local schools, institutions and markets. It features a range of activities where children of all ages can try anything from sorting games to creating imaginative figures or jewelry out of waste. All activities add to the narrative of waste as a resource. The camper van is also designed as an exemplary sorting kitchen made of recycled materials, which inspires people to use waste as a resource at home and reflect on everyday choices – especially when cooking. The Sorting Beetle engages with children at their level, and makes them ambassadors in their own families by providing information on waste sorting, recycling and upcycling through play and fun games. The children’s ideas and creative products are showcased to inspire others – not only in The Sorting Beetle, but also at Hjørring Library and at the project partner, AVV’s, visiting center. With activities and games in The Sorting Beetle, children become responsible ambassadors for waste sorting, recycling and upcycling. By teaching children and citizens about using waste as a resource, the project encourages reduced food waste, increased waste sorting and an increased focus on sustainable consumption. Improved waste sorting and recycling contributes to a reduced carbon footprint. Of visitors to The Sorting Beetle, a total of 89% have mastered how to sort difficult types of waste. The Sorting Beetle focuses on waste treatment and the time it takes for waste to degrade in nature. Waste as a useful resource is an integral part of the education process. Hjørring Municipality is a municipality in North Jutland Region on the west coast of the island of Vendsyssel-Thy.